As English journalist Malcolm Muggeridge aged, he embraced increasingly conservative principles. Moving from atheism to theism to Catholicism, he adjusted his views, publishing books and articles reflecting his ideology. Enjoying an extraordinary network of friends and acquaintances, Muggeridge interacted with the prominent voices of his day, including authors, films stars and politicians like U.S. President Ronald Reagan, with whom he shared a contempt for abortion. Malcolm Muggeridge connected with other conservative politicians, as well. 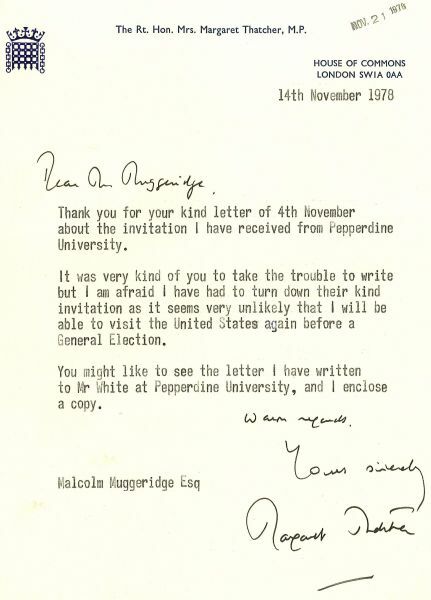 In 1978, he evidently encouraged Margaret Thatcher, former Prime Minister of Britain (who died at 87 on April 8, 2013) to accept an invitation to speak at Pepperdine University. At this time, Thatcher was still a Member of Parliament. Unable to attend due to prior commitments, she sent gracious responses to both H.A. White, president of Pepperdine, and Muggeridge.